to California's North Coast... and beyond! Learn to play the steel drums in our fun and enriching classes! We welcome students of all ages and all levels. No previous musical training required. Our classes are taught in the traditional "rote" style of Trinidad and Tobago. This method emphasizes learning by ear and by feel. It is therefore not necessary that students be able to read music. There are different levels of instruction to suit your abilities. We provide the instruments -- you simply bring your willingness to learn and your enthusiasm for this exciting art form from the West Indies. Parents with young children: We provide a play area for those too young to enroll in class. This allows a safe place for your child so you can focus on learning. It also exposes children at an early age to live music, rhythm, and a positive group dynamic. Adult Pan 1 meets Friday mornings 10:30-11:30. $55 for each 4 week Session. Adult Pan 1 meets Monday Nights 7:00-8:00. $55 for each 4 week Session. These classes are suited for Beginners with little or no music experience. By learning to play short tunes, students are exposed to rhythmic fundamentals, stick technique, and an understanding of the roles of each of the five basic instruments within the steel band orchestra. Students are also given a brief history of the origins and development of the steel drum. Meets Friday mornings from 11:30am - 12:30pm. $55 for each 4 week Session. This class is for students who have graduated from our beginning classes and/or for students with a musical background. Intermediate students are gradually introduced to more challenging parts while focusing on the further development of rhythmic awareness, memorization skills, technique, and independence. Greater emphasis is placed on finding your "voice" in the steelband instrument family. Meets Monday and Thursday nights, 5:30 - 7:00pm. The focus of this class is building a repertoire of music for local performances, attaining greater proficiency on your chosen instrument, and the skills necessary to teach your part to others. 1½-hour class. Great for birthday parties, family gatherings, or groups of friends that would like a class designed for fun and cultural enrichment. We have a small kitchenette available for drinks and snacks to enhance the party atmosphere. Groups of up to 10 people $200. $15 for each additional person for groups of 11 and over. We can accommodate a class size of up to 30 participants. Recognizing that music plays a vital role in the development of young minds, Pan Arts Network has held steel drum classes for elementary, middle school, and high school students since its inception. Children who participate in the classes gain greater self-confidence, learn how to listen carefully, work cooperatively, and develop patience and discipline. 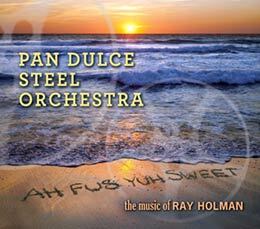 We are pleased to announce the release of Pan Dulce Steel Orchestra's new cd "Ah Fus Yuh Sweet - the music of Ray Holman". Become a fan on Facebook and learn about upcoming performances and news. Copyright (c) 2010 panArtsNetwork.com. All rights reserved. CSS template: CSS Templates.